In May, the government confirmed that two new local authorities should be established in Suffolk. A new East Suffolk District Council will be formed of a merger between Suffolk Coastal and Waveney councils. West Suffolk Council will be made up of a merger between St Edmundsbury and Forest Heath councils. The Commission has now finalised the wards which will be represented by East Suffolk’s 55 councillors. The new arrangements will come into effect at the council’s first elections next year. 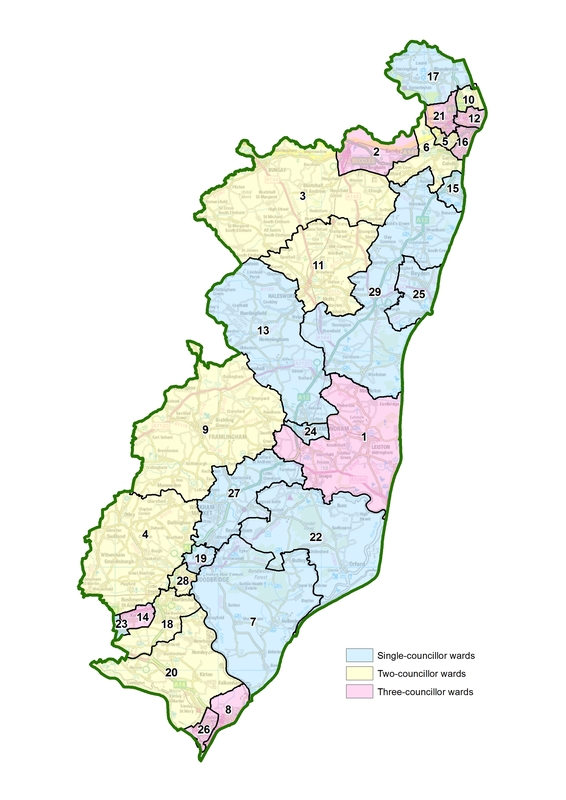 A review of ward boundaries for the new West Suffolk Council has taken place at the same time. The Commission’s final recommendations propose that East Suffolk’s 55 councillors should represent eight three-councillor wards, ten two-councillor wards and eleven one-councillor wards. In its draft recommendations, the Commission proposed a large Blyth Estuary ward to include Southwold and several surrounding parishes. Responses to the consultation suggested that different parts of the proposed ward had differing community interests and issues facing them. Respondents argued that two wards, each represented by one councillor, would be a better reflection of community ties. The Commission has listened to those views and has changed its recommendations to create a Southwold ward alongside a Wrentham, Wangford & Westleton ward. Each ward would be represented by one councillor. As part of its draft recommendations, the Commission proposed that Aldeburgh should be included in a Sandlings ward alongside communities to its south. Respondents to the consultation argued not only that Aldeburgh shared closer community ties with Leiston to its north but that the River Alde was a strong boundary to the south. The Commission has changed its recommendations in this part of East Suffolk so that Aldeburgh will be part of a three-councillor Aldeburgh & Leiston ward. To the south of the River Alde, the Commission has made further changes to its proposals in response to local views put forward during the consultation. For example, it has changed its proposal for a two-councillor Rendlesham & Wickham Market ward to create a one-councillor Wickham Market ward which keeps together a grouping of parishes that shares strong community ties with the town. To the south, the Commission proposes a Rendlesham & Orford ward alongside a Deben ward which better reflect community identities and interests as well as using boundaries such as the River Deben and Butley River as strong and locally identifiable boundaries. Elsewhere in East Suffolk, the Commission has made minor changes to its draft proposals as well as changing the names of some proposed wards as a result of local suggestions. The full recommendations are available on the Commission’s website at www.lgbce.org.uk. In May 2018, the government confirmed changes to local government in Suffolk. The decision means the creation of a new East Suffolk Council and a new West Suffolk Council. Full details of the Commission’s final recommendations (including maps) can be viewed at: https://consultation.lgbce.org.uk/node/13250.